The IntelliTrack Video Tracking System offers a large number of measures to analyze movement and behavior. 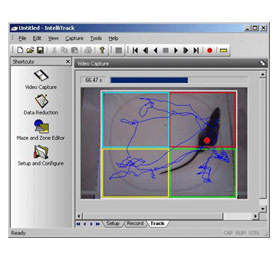 The IntelliTrack Video Tracking System is also a powerful, versatile video based motor activity analysis system that is excellent for tracking animal movements. Data Collection & Reduction Data is collected using the subject centroid and leading edge. This prevents data skewing and aids in differentiating between fine movements and ambulations. Collected data is funneled into a comma delimited SDF file specifically set up for easy export into spreadsheets or statistical programs such as Excel.